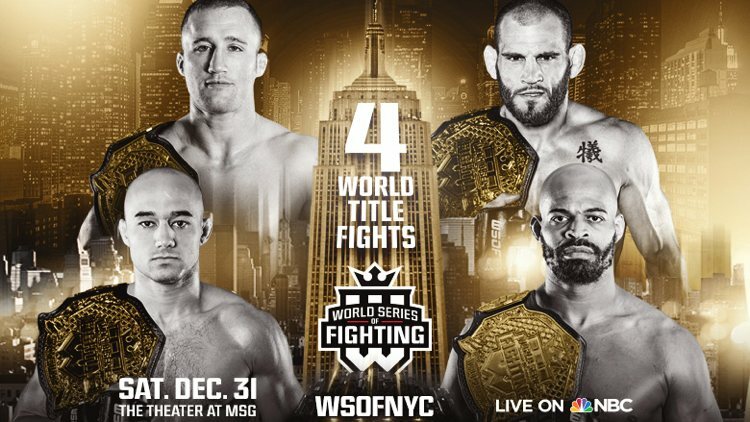 World Series of Fighting (www.WSOF.com) on Monday announced a stacked eleven-bout fight card for the unprecedented New Year’s Eve world championship extravaganza at The Theater at Madison Square Garden in New York City. The WSOFNYC mega-event boasting an unmatched roster of world-class athletes will air live on NBC Sports (3 p.m. ET – 4 p.m. ET on NBCSN and 4 p.m. ET – 6 p.m. ET on NBC) on Saturday, December 31. In the main event, undefeated lightweight (155 pounds) kingpin Justin “The Highlight” Gaethje (16-0) defends his crown against Joao “The Brazilian Samurai” Zeferino (20-8) and, in the co-main event the highly-anticipated welterweight (170 pounds), reigning world champion Jon Fitch (28-7) squares off with number one contender and fellow decorated superstar Jake Shields (31-8). Reigning bantamweight (135 pounds) champion Marlon Moraes (16-4) will also put his title on the line against ferocious contenderJosenaldo Silva (25-4). Light Heavyweight and Middleweight Champion David Branch (19-3) will put his Middleweight (185 pounds) belt on the line against challenger Louis Taylor (13-1).